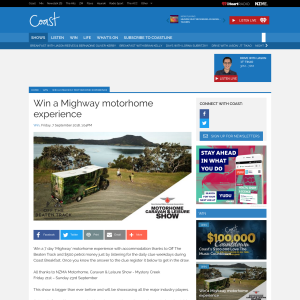 Win a 7 day ‘Mighway’ motorhome experience with accommodation thanks to Off The Beaten Track and $500 petrol money just by listening for the daily clue weekdays during Coast Breakfast. Once you know the answer to the clue register it below to get in the draw. This show is bigger than ever before and will be showcasing all the major industry players. Get ready for exciting new product launches, great innovations and some truly unbeatable deals. The show is BIG this year with well over 12,000 square metres jam-packed with the very best the industry has to offer including the brand new OTBT Marquee full to bursting of your favourite accessory, destination and outdoor lifestyle exhibitors!